According to Maryland Solar United Neighborhoods (MD SUN), Thursday, July 31, is the final day for homeowners in Hyattsville and Mt. 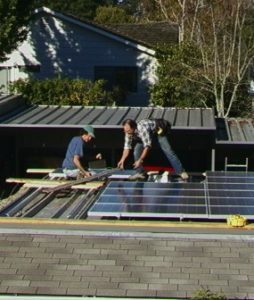 Rainier to join its local solar coop. As of July 14, there were 40 households signed up to purchase solar in bulk, according to Chris Yeazel, Program Director for MD SUN. Yeazel says the group formed in early January 2014 and picked an installer in mid-May. There is no final commitment upon sign-up. After the July 31 sign up deadline, residents have until August 31 to sign a contract with the installer. Why join a solar co-op? By going solar as a group homeowners can save 20-30% off the cost of a solar system. They’ll also have the support of the group and free technical expertise provided by CPN instead of navigating an often-complicated process alone. Sign-up deadline for the Hyattsville-Mt. Rainier Solar Co-op is Thursday, July 31st!